We would like to remove the mirror on the wall adjoing the fridge on a 2005 KSDP 3909. It looks like it is attached with double back tape. We would rather have pictures of the kids and grandkids on that wall ...... not real crazy about all the mirrors. Has anybody removed these mirrors? About 1/4 the up from the bottom is the tape mentioned in your OP. There is also a foam substance between the sticky sides of the tape. The top of the mirror are hard mechanical hanger(s). Pull out the bottom until the tape gives way. Then push up with a bit of a wiggle. If that does not work, try going to the left then to the right. I had our mirror off (forgot why) several years ago. This is how I remember removing it. The wife did not like it removed so I had to reinstall it. I am suprised it has not fallen off. The 2 pictures that Nemwar put on our bathroom wall fell off last month. They were held on with 3M double sided taoe. I can see from the edge of the mirror that it is held on with the double back foam tape the full length of the mirror. It is mounted flush with the cherry plywood that forms the wall on the side of the fridge. GaryKD, I don't see any metal mechanical attachment at the top. tncrusier, The heat gun and fish line sound like a clever idea. I wonder if the tape will leave any marks on the cherry plywood? Never like the mirror's either placed our family pictures in fact the family grow so big the frames were increased to accommodate them all. My mirror was as Gary described Velcro strip on bottom and metal clips at top after you lift mirror off them. Use a steady pull on bottom and it will release than just lift. If you have a large frame for all you pictures and maybe added little ones will hide any screw holes or you can use a wood filler. My wife likes pictures and they are in bathroom's, bedroom and living area. Makes it more homey that way. I wish ours was attached with velcro. I know it is not going to be easy to remove with the double back tape as a fastener. The mirror is made in two sections, each about 10" wide and 36" high. I'll have to learn how to post pictures ...... worth a 1000 words. I am always afraid of the mirror breaking when trying to remove one. I would cover the mirror with duct tape before trying to pry it loose. I have your picture now Gary, there is no frame around your mirror's just tempered glass. What you need to do is use a wide spatula and force blade between the two layers of Velcro or tape to back of mirror and pry out to separate mirror off back Velcro or tape. As you pry place some weg sticks between the space opened maybe have some help if you need it to hold mirror out as you pry. Place duck tape over glass as Romeo said in case glass cracks, the glass will not shatter just crack if at all. 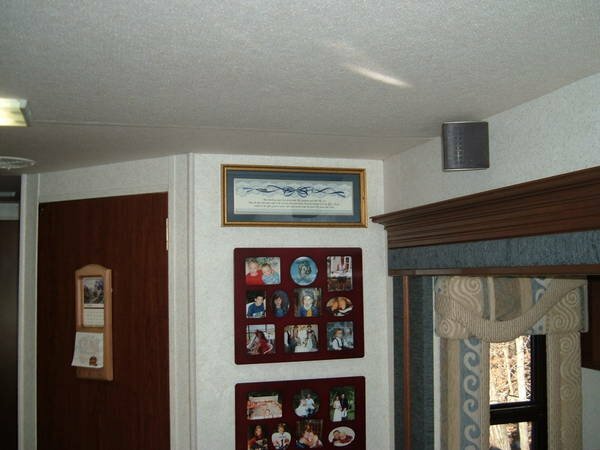 When you remove Velcro or tape on wall use a hair dryer to loosen sticky on Velcro off paneled wall. Try some Glue be Gone to clean wall surface.